The article was touted on Twitter and even appeared in the Associated Press newsfeed. The number of Clay’s fans on Facebook more than doubled. And, most important, comments flooded in to the blog, the Inquirer, the Life with Clay Facebook page and via email. There was a wonderful, warm outpouring from parents, teachers, family, friends and even people who hadn’t before understood autism. Some talked about how their child, too, boasts intelligence and a sense of humor, like the parents of a 20-year-old who noted that the first thing their son typed was: “I am not stupid.” He has been typing for six years now, and provided some funny (and rather salty) moments for them. Another parent shared that their child is a whiz at knock knock jokes. Others pointed out how their child has similar quirks, like one whose son throws away Pringles containers whenever he sees them or another who draws many, many Dunkin’ Donuts pictures. There was even a generous offer of some toy trucks from a man in public relations at Penske Trucks, who read with interest of Clay’s early obsession with the brand. Clay seemed to take his status of king for the weekend in stride. Thankfully, when he and his Mom took a trip to the local health food store for weekly supplies, there were no paparazzi lurking nearby. Of course, I was wondering what he thought of all this, so we managed to pry the newly minted celebrity out from under his comforter Sunday morning for a hastily called session with the local media (my wife and me). Since he conducted this session in his pajamas, I like to think that this recent notoriety has not changed the little guy’s basic humility, his connection with the common folk—like his parents. Only time will tell. This entry was posted on January 17, 2011, 6:33 am and is filed under Communicating, Daily Life. You can follow any responses to this entry through RSS 2.0. You can leave a response, or trackback from your own site. Love it! You rock, Clay!!! So glad so many people saw the article, congrats! 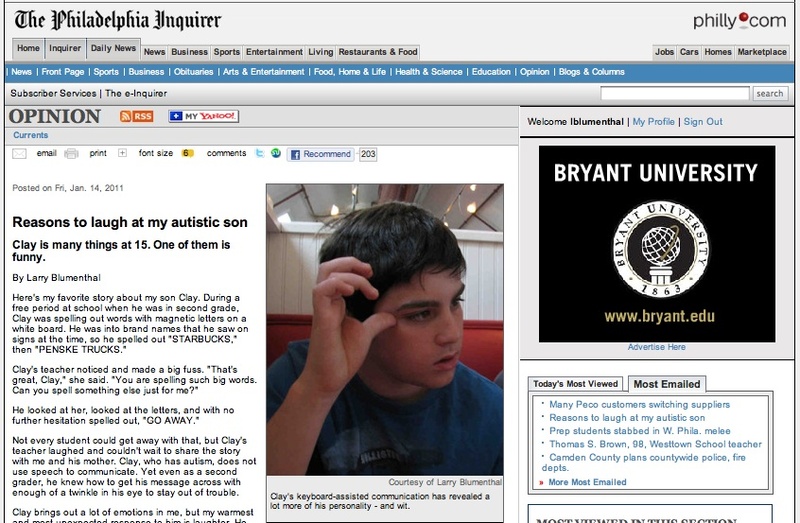 I have a Down Syndrome son and your last sentence of the 1/14 Inquirer article is exactly what I feel about him, “He makes me laugh” I hope a large number of people read the article, most particularly, because it is about autism. I think a lot of people could understand me saying this about a Down Syndrome child but probably would were a bit surprised it was about an autistic child. Our best to you and your family and thank you for educating people. Thanks. Glad I found your blog, as well. The best thing about the article has been the connections we made. Larry, Clay is Clay, and he will constantly amaze us in the future. How can you not love the guy. You are teaching the people who reply that there are great minds behind special needs children. Keep up the good work.